So here I am again with my morning cup of coffee and some squares of chocolate. I really like to try out different chocolate (always dark never milk). But there are some favourites. 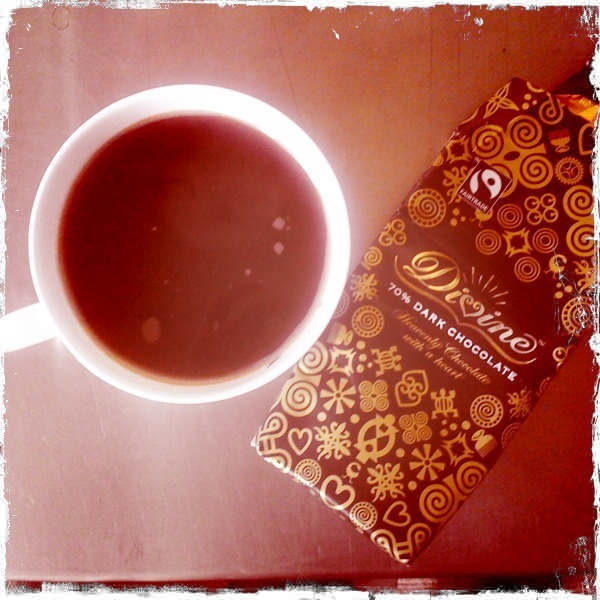 And my ‘regular’ choice for quite some time has been Divine’s 70% bar. Dark, smooth, nicely chocolatey, not bitter. And sensibly priced. A great everyday bar. So imagine my delight when the people at Divine told me there was an 85% bar being launched and would I like to try it? Would I? I leapt at the chance. Here I am looking suitably excited before doing a comparative tasting of 70% vs 85%. Now I’m someone who likes 100% cocoa solids chocolate, its weird and bitter but really nice. So I wasn’t too worried whether I would like the 85% more just interested to find out how it would compare. I took a quick shot of squares of each lined up. I was surprised that the 85% didn’t really look much different (the squares on the right). I moved on to tasting….. The 85% was unusually smooth and not bitter, often at this level there can be quite a strong bitter after taste which, depending on what you like, puts some people off. This wasn’t like that at all. It retained the smoothness of the 70% but was more intense, more chocolatey, perhaps more fruity. At the moment its only stocked in Tesco but the lovely people at Divine tell me that it will be coming to other shops soon. I hope so because I want some more. Soon. And thanks for the sample bar….it didn’t last long! I found this chocolate at the Co-op. I know its not supposed to be cool to shop at the Co-op but actually if you are a fan of fairtrade and also of local foods they are actually very committed to both these things. Much more so that pretty much any other supermarket. This chocolate is dark, has a nice smooth texture. The orange spicing is mild and subtle and balances well with the chocolate. Naturally I like it best with a cup of coffee. Best of all its sensibly priced at just over a ? ?1 a bar. You can’t say fairer than that. Everyday is a great day for eating chocolate as far as I’m concerned but today there is the extra opportunity for a sneaky bit of chocolate if the Easter bunny has dropped off some chocolate eggs whilst on his/her rounds. I haven’t found any so far but I did try out a different chocolate bar as a special treat. 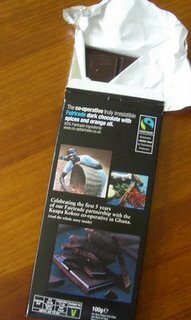 Today’s chocolate is “The Co-operative truly irresistible Fairtrade dark chocolate with spices and orange oil”. Sounds interesting, and with Fairtrade ethics to boot to ease my conscience while I’m munching away. I’m quite a fan of Green & Blacks Maya Gold which is also based on orange and spices so it will be interesting to see how I like the Co-op product. Like most ‘luxury’ bars of chocolate it only weighs it at 100g but priced at £1.25 (currently with 20% off its £1.00) it’s a lot cheaper than a lot of other options. Its split up into 8 big squares – that’s it – but actually psychologically this works – you can kid yourself you are only having just 1 square not the 4 its probably equivalent to in a Maya Gold bar. Taste wise how did I get on? I really really like it. Its smooth, got a nice dark chocolateyness, a zing of orange and a nice hint of warm spiciness (when I checked on the back its got cardamom, cinnamon and ginger). Plus it snaps in that really pleasing manner (Green & Blacks doesn’t quite snap right for my liking as the bar is quite thick, this is more like a Rococo snap but at about 1/3 the price). Overall a bit of a winner – I think it’s the cardamom that does it.